Architectural Heraldry in Dumfries and Galloway was the subject of Hon. Professor James Floyd of Heriot-Watt University when he addressed a large audience of Dumfriesshire and Galloway Natural History and Antiquarian Society members in early November. The origins of heraldry lie in the 12th century when knights, wearing a full face helmet, needed to make themselves readily identifiable in battle and at tournaments. A Coat of Arms, which must include at least a shield, is borne by only one person at a time and, as heritable property, is passed on to the heir, typically the eldest son. William the Lion (1165-1214) was one of the early Scottish kings to bear the red lion rampant within a double tressure on a gold shield as the emblem of the Scottish crown. There have been variations over the centuries in the design of the Royal Arms of Scotland, examples of which can be seen on the Midsteeple in Dumfries and on the Pend at Whithorn. Both have been conserved by Historic Scotland using special potassium silicate paints, which allow the stone to breath, and with gold leaf used for the gold charges. 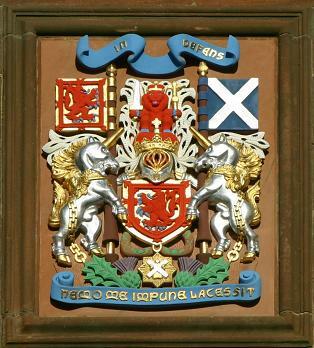 The current version of the Royal Arms of the United Kingdom, dating from the start of Victoria’s reign in 1837, can be seen on the County Buildings in Wigtown and vary slightly when used in Scotland or England. In Scotland the red lion rampant (‘Scotland’) appears in the 1st and 4th quarters of the shield (top left and bottom right as seen by an observer) with the three English lions or leopards (‘England’) in the 2nd (top right) quarter and the Irish harp in the 3rd (bottom left) quarter. Four mottos are used, two representing Scotland (IN DEFENS and NEMO ME INPUNE LACESSIT) and two representing England (HONI SOIT QUI MAL Y PENSE and DIEU ET MON DROIT. When used in England, nationally and worldwide (for example on embassies), the Scottish and English quarterings are counterchanged, with ‘England’ in the 1st and 4th quarters, ‘Scotland’ in the 2nd quarter and ‘Ireland’ in the 3rd, as before. The County Buildings in Wigtown also carry an older ‘Stuart’ version of the Royal Arms, bearing the monogram CR, representing Carolus Rex for Charles II, and dated 1678, which is older than the building and must therefore have come from some earlier building. This is termed an ‘orphan’ panel, in contrast to a ‘widow’ panel which is a Coat of Arms left behind on a building when the original owner of the arms has moved on elsewhere. However, examples of the English quartering of the Royal Arms can often be seen in Scotland, such as on the former Post Office in Annan and on the (now removed) ‘By Royal Appointment’ panel on the former Gates Rubber factory at Heathhall. Local Authorities have been enthusiastic users of Coats of Arms on Municipal Buildings and they reflect changes in the organization of Local Government in the region. The arms of the Royal Burgh of Dumfries, featuring the Archangel Michael slaying the dragon, can be seen on the Council buildings in Buccleuch Street, along with the rallying cry 'A Lore Burne', which is etched on the glass door. The arms of the Royal Burgh of Annan relate to the Bruce family, while those of Annandale and Eskdale District Council also incorporate the golden fleece of Langholm. The arms of Sanquhar use a crest of a demi-dragon, borrowed from the Crichtons, together with their family motto of ‘GOD SEND GRACE’. 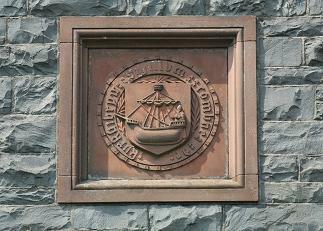 The seal of the Royal Burgh of Kirkcudbright, carved on the wall of the Museum there, shows St Cuthbert with St Oswald's head on his lap. The welcome sign at Dalbeattie incorporates charges from the arms of the Maxwells of Munches, a local family, and carries the motto ‘RESPICE, PROSPICE’ (Look back, look forward). New Galloway uses the boar from the arms of the Gordon family while Castle Douglas Town Hall has a crowned and winged heart with two stars or mullets and the motto ‘FORWARD’, taken from the family of Douglas of Castle Douglas and used in the town’s arms. The arms of Stranraer are of very early date (1673) and unsurprisingly feature a ship. Throughout the region there are many examples of Family and Corporate Heraldry. Somewhat surprisingly perhaps for almost the southernmost town in Scotland, the magnificent quartered arms of the North of Scotland and Town and County Bank, an Aberdeenshire bank formed by merger in1908, can be seen on the north corner of Bank Street and Irish Street. This is a ‘widow’ panel and uses Petra Sancta, a system of engraved lines and other markings to indicate particular colours, suggesting that these particular arms were never intended to be depicted in colour on this building. The arms of the Scott family appear on the Buccleuch and Queensberry Hotel, Thornhill; and The Douglas Arms, Castle Douglas, also has a lovely armorial sign, unfortunately marred by the surrounding clutter of road signs. Churchyards throughout the region reveal many examples of heraldry. Kirkpatrick of Closeburn's arms have a crest of a hand holding a dagger, dripping blood and carrying the motto 'I’LL MAK SICCAR,' recalling the final blow delivered to the Red Comyn in the Church of the Greyfriars in Dumfries. St Michael's Church and Churchyard are particularly rich in heraldry: for instance, the marble memorial to Sir Thomas Reid, Bart, FRS in the church porch. An example of a lady's arms, using a diamond-shaped lozenge, rather than the more masculine and war-like shield, can be seen on the memorial to Ann Kennedy of Knockgray. Unlike city memorials, rural gravestones stand in clean, clear air and are thus commonly covered with lichens, which can sometimes mask and erode the carved features on the stone and will ultimately lead to its destruction. This excellent talk, delivered by a very good speaker and beautifully-illustrated, produced a very interesting question and answer session, mainly covering aspects of the work of the Lord Lyon King of Arms, an appointment with judicial rank, who has the power to grant a Coat of Arms to anyone with Scottish descent or connections. He and his officers maintain the Public Register of All Arms and Bearings in Scotland, exact payment for the Treasury for the granting of arms, and pursue misuse of non-registered arms in Scotland. The advice has to be that we should keep our eyes open as we travel about the region for examples of Coats of Arms in our towns and villages, to study the detail thereon and to look out for his gazetteer of heraldry when it is published.